Filipinos would like to think they are “pro-poor” and “pro-worker”. Yet, this is a society where many of its most vocal “influencers” maintain lifestyles propped up by cheap labour. And why is labour cheap in the Philippines? Well, it is not because their employers are “evil” as communist “activists” would like us to believe. In fact, it is really nothing personal. It’s just free market economics — specifically that inconvenient law that is its pillar: the Law of Supply and Demand. Indeed, most Filipino households middle-class and above are kept humming on the back of a team of very “affordable” household help. After all, why invest in good labour-saving household devices when you can simply pay servants peanuts to clean after you? Indeed, poverty is what keeps wages low. And wages are low because, for every worker kicked out of the payroll for demanding too many “rights”, there will be at least a hundred odd applicants making a beeline for the newly-vacated job. You wonder then whether these labour “activists” are actually doing the average Filipino worker a real service. Considering that many of these “activists” are students in the Philippines’ top universities, it is worth questioning how much real skin in the game these rabblerousers actually have. It is likely that, in the aftermath of the the next labour-vs-management negotiation they inflame with their Cold War-era rhetoric, workers will lose jobs while these “activists” simply go back to their respective schools or, worse, move on to the next “activist” circus. One should actually step back and examine whether demanding more “workers’ rights” is really the solution to so-called workers’ “issues”. For one thing, Filipino workers are easily replaceable. The Philippine islands is essentially an enormous pile of able-bodied workers that can be thrown into any labour-added-value industry by the shovelload. And the Philippines’, for that matter, is primarily a labour-added-value economy which, in a way, is good news for these hordes of workers wearing down their roasaries everyday praying to the Almighty for jobs. Capital, on the other hand, is not as replaceable. Indeed, the Philippines is forever begging for capital, no thanks to its renowned inability to create and grow it indigenously at scales that modern global economies demand. So between the “plight” of workers and the flight of capital, the bigger risk to which the Philippine economy is exposed to, in the bigger scheme of things, is quite clear. What is really concerning is that the big fact at work in the Third World is that “more rights” will not solve workers’ issues. It is more employers that will ultimately solve the supply-to-demand imbalance that allows employers to treat their workers like carabaos. 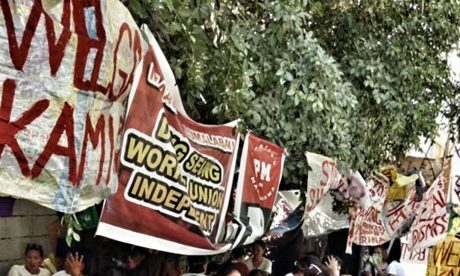 In short, Filipino-style “labour activism” is more likely to be poisoning the Filipino worker’s cause than actually enriching it. The Philippine economy is perennially starved of capital which, any “economist” worth their salt will tell you, is what ultimately creates employment. Most important of all, Big “bad” corporations have deep pockets. Many can weather those quaint labour spectacles these communists incite every now and then as well as those even more quaint “boycott” campaigns Manila’s Titas “trend” on Twitter as they sip their lattes at the corner Starbucks. Big “Bad” Corporate will weather a strike and likely live to fight another day. The average Filipino worker likely won’t. Most tragic of all, once tainted with the stench of commie-originated unrest, veterans of strikes are likely to be marked for life — and doomed to a lifetime of impoverishment. That is, unless they can reinvent themselves as “professional activists” and make a career out of organising those strike-and-run “activist” spectacles we see on TV today. This cannot be helped. Even those who consider themselves here as “forward intellectual thinkers” cannot even properly identify rights from a mere privilege, leading to conclusions that have lead to very dangerous ideas. 1) A person looking for a job must understand that he/she is SELLING his/her SERVICE. 2) Therefore a person has no right to expect PURCHASE of HIS/HER SERVICE just because. From that alone, you should know now that there is no basic human right to have a job or basic human right to employment. It’s either someone buys your service or not OR someone employs you or not. But thanks to Karl Marx, we now have these people thinking the opposite. And when employed, starts demanding for just because they can and the government is going to back them. >> 1) A person looking for a job must understand that he/she is SELLING his/her SERVICE. Therefore a person has no right to expect PURCHASE of HIS/HER SERVICE just because. Also known as “an honest day’s work for honest pay”. The problem is that most Filipinos can’t conceive of the idea of a mutually-beneficial exchange. In their heads, every interaction is a zero-sum power struggle. Either you cheat me, or I cheat you. Or we both cheat each other. Hence the obsession with Marxism, which is aimed not at creating fairness but in inverting the power hierarchy (stupid people ruling over the smart people, with all that that entails). I once had someone ask me to provide him with a job on the basis that “I don’t have a job at the moment”. He didn’t seem to understand that this is a complete non-reason, and that for me to justify giving him money he’d have to offer me something in return. A unique feature of the Philippines is that “the poor” have an unshakable belief (a) in their own inherent superiority and (b) the inherent inferiority of “the rich”, who have apparently got where they are by pure luck rather than hard work and initiative; as a consequence, “the poor” think that “the rich” are gullible and unintelligent, and easily relieved of their funds via simple-minded manipulation. It never occurs to them that, when “the rich” occasionally do give them jobs or money against their better judgement, it’s out of a sense of sympathy and fairness, not because they’re stupid. Although on reflection, maybe it IS because they’re stupid: you have to have something a bit wrong with you to invite the shitstorm of problems that come from employing Filipinos. That must be the prime target of these labor activist groups–to impoverish the whole nation. They are in no way thinking of ever uplifting the economic welfare of those they pretend to support. These activists are mostly connected to the overly obsolete communist movement in the Philippines, poor people, esp. the young ones, are the easy prey to recruit into their folds, injecting into their vulnerable minds the reasons they become poor are the gov’t and the rich capitalists! Without those poor souls, there will be no one who would join the Reds! rights. He could make every one around him cry or kill for the speeches he would deliver at the gates of Malacañan Palace against the govt of Cory Aquino when he was still the President of the NSA (National Student Alliance)….but what happened when he was already part of the gov’t, esp. when he was one of the cabinet secretaries, was completely the opposite of what he was fighting for during his college days. In fact, he became one of the most controversial figures during GMA’s presidency. Point is, these noisy student activists now, will one day will become managers in their chosen fields. I’ll tell you, they will side with their employers once a labor dispute arises and forget everything they fought for during college activism days because they would realize that most workers who are connected to the leftist or reds are actually the abusive ones! I know, because I was once a student activist and I almost became a full pledge supporter of the reds movement through the LFS connections where one bright but lost soul who was very close to us was the late Rolando dela Cruz, the Adamson SG President at the time (died in the mountains as a member of the reds). I remember during my college days in history class when one of my professors discuss about these “activists.” He even said “sabi nila pinagtatanggol raw nila ang karapatan ng mga mahihirap, pero bakit sila naghihirap?” That question makes sense because one of the reasons why Filipinos are poor is due to their sense of entitlement and laziness. The idea of hero-martyr-saint is the dominant moral value Pilipinos agreed upon. One thing about this idea is that, it requires a sacrifice of life, so if you are true to the idea, you mus be ready to sacrifice your life, no question ask, just like Rolando dela Cruz, but if you just want to make a political career, you can use the idea to sound like a hero-martyr-saint, just like Mike Defensor. Rolando dela Cruz would have been one of the brightest young leaders of our time because he had all the qualities but wasted nonsensically when his belief in communism permeated his whole system! Or maybe the corrupt system in our government would just swallow him too! “Workers of the world unite…you have nothing to lose but your chains”, from the Communist Manifesto … Labor is cheap in our country, because we only developed, service industries. We did not industrialize, where skills and talents in manufacturing could had built skills , knowledge and talents that demanded better pays for workers, and built the middle class. Our country has no middle class. You either have to be too rich, or too poor. Politics is our biggest industry. Stealing from the government is the way to riches. Example is the Automotive industries. There are a thousand parts of a car. Every part has to be manufactured, that required skills and knowledge. So, every part can establish a manufacturing industry, that employs people… See how many jobs one part manufacturing company can hire ? We have no steel industries, which is the basic industry for industrialization. We have mining industries; however, we sell the Ore Concentrate at bargain prices to industrialized countries, where they will be processed to finished products. Why can , we not process our ore concentrate to finished products ? The fault here is the mindsets of most of us. This negative mindset and attitudes are mostly found in Third World countries like us. No amount of rallies, or identifying yourselves with the poor can solve our poverty. Unless the Filipino mindset will change; nothing will change. You can change the government or political system or anything. But, if we cannot change and improve our mindsets, nothing will change ! These are all influence of elite mentality. Mentality that we inherited from the colonial elite that goes far far way back up to the time of the Roman empire, who influence much of Europe that includes the Spanish empire who then influence Latin America and the Philippines where the locals adopted them and passed them on to the ordinary people. Philippines is not industralized nation. IT IS NEITHER AN AGRICULTURAL COUNTRY because Philippines smuggle rice from Vietnam and Thailand because they cannot produce it. They also smuggle Apples, Garlic, Onions. No industry. No agriculture. Only drugs. That is why Filipinos are happy. It is fun in the Philippines. It is pretty funny how Filipinos can’t even grow the one thing they believe is quintessentially Filipino. I’ve noticed the reason is the usual one: an astounding level of arrogance. Filipinos think they’re always right and everyone else is wrong, therefore the Filipinos know how to grow rice better than anybody else, therefore there’s no need to look at what other people do to learn how to do it properly. Not that rice is of any human or economic importance. Filipinos think they have to grow rice because they’re poor, but it would be more accurate to say they’re poor because they grow (and eat) rice. You could grow all sorts of profitable crops here, but the Filipino simply doesn’t want to. Or you’ll find you must go without. Never heard that song? Filipino writer? It’s so illogical it surely must be. Filipinos really are gluttons for punishment. If rice is so hard to grow and gives you so little return (ie., keeps you in constant grinding poverty), then why do it? Seems like they’d rather spend all day up to their knees in mud complaining about how poor they are, than grow other crops that are less trouble, more profitable, and more nutritious. First Time. GF told me about this song. When I read the lyrics I LOLed and LOLing whenever my GF sings the jingle. The song is reflective of planting rice. Today the Filipinos do not plant rice. They import. If they cannot import they smuggle. If they cannot import and smuggle they eat bread. There are now plenty of boulangerie in every street corner. Yes, Marius, Filipinos import bread ingredients …. they import everything in the Philippines …. they even import German beauty contestants. First they married them off to foreigners. They produce Miss Universe candidate. Here is another one, they export Filipinos to New Zealand and import them back again to represent Miss Earth. Megan Young was an American. Looks like American like me because Filipinos find their looks super-ugly to be Miss beauty contestant. stretching muscles is good for the health. and then tomorrow back to work! the whole day you’re bent like an ox. till you’re done you cannot sit. and my waist, its tired and sore. soaked in water, six to six. so I can have a tasty meal. I won’t earn a single dime. PLANTING RICE ARE FOR THOSE IN THE FRINGES OF POVERTY. NOWHERE TO WORK. NOWHERE TO GO. PLANTING RICE IS NO JOKE. FARMERS PLANTING RICE IS A JOKE. PLANTING RICE IS A CRUEL DESTINY. IT IS A PUNISHMENT OF THE SINS OF THEIR FOREFATHERS ….. The first mentality that must be change is the “paasa-asa sa awa” mentality. The worst thing that have develop among the poor is that they have learned to exploit your pity and compassion, that if you are not going to give anything to them then you are easily accuse of being a very bad and cruel person. Yup. Emotional and moral blackmail. pacquiao will no longer pay his debt at the BIR? that’s a big slapped for the pilipino taxpayers. YES. A hero should not pay Taxes. Pacquiao made Filipinos good for free. Making them feel good and proud for free is non-taxable. Pacquaio is the best thing that ever happened to Filipinos because Filipinos have no life-altering contributions to the world. Filipinos also love Pacquiao because Pacquiao is uneducated like them. Like, Boxing, it is education-optional. Its skills can be derived from prison rumble and street fights no education necessary. The problem with labour activist is that they don’t even understand or has no knowledge of the meaning of the word “labour” itself. Labour is that power that enable us human to interact with, get and create something of what is available in Nature, in other words, labour is the money you spent to buy something from Nature. Labour is not just muscles and brawns, it also includes intellect and skills, for how can one work on something if he/she doesn’t even have any knowledge of the thing that is to be work upon. What is it do you need in order to operate a machine? You have to have a certain degree of knowledge to get yourself working. So where do you get knowledge? By education, it is the factor that gives and determines the quality of labour. So here is why the workers is where they are in a condition where they are in no position to bargain, they got a low quality of labour, and because such quality of labour abounds, labour value becomes cheap, so a worker has no other choice but to accept that of what is being offered as wage. I HAVE A THRONG OF HOUSEHELPS. An army of them. A phalanx. A platoon. I got a chauffeur. A gardener. A cook. And others just to vacuum clean the rest of the house. 10. They buy their own food. Saying being “pro-poor” or “pro-workers”, is really a sign of transcendental elite mentality, as someone who wants to be seen in a position high up there looking down because they don’t want to be categorize in the same condition of being poor and just a worker, in other words there is this stigma of being “nakakahiya”. They would like to be seen as a hero or defenders of the oppressed(tagapagtanggol ng mga naaapi), no, they don’t want to fight as one “with” the ordinary people, they want you to think they are fighting “for” the ordinary people.